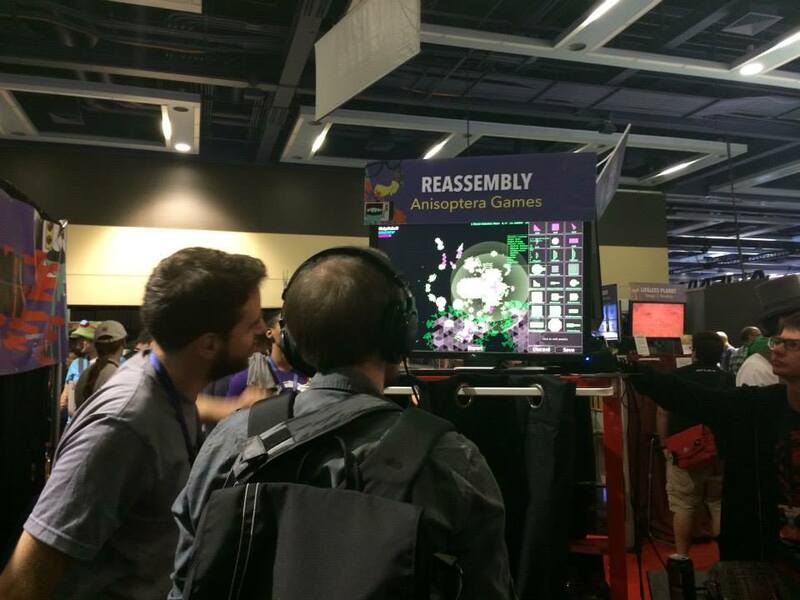 Submissions for PAX East 2014 are opening soon so I thought I would write up my experiences showing Reassembly at PAX Prime in the Indie MEGABOOTH Minibooth last month. The MEGABOOTH was a very positive experience for us – in addition to having a great time we launched a kickstarter campaign the day we got back and successfully raised $35,000 to finish the game. I (Arthur) wrote Reassembly and run Anisoptera Games. I’ve been working on Reassembly full time for about a year and a half, before that I worked at Nvidia. Peter Brown composed music and sound effects for Reassembly. Colin, Rob, and Christine from Indie Voyage ran the kickstarter and are helping out with PR, marketing, QA, and production. We shared a hotel with my friend Greg Batha who was showing Bit Bit Blocks at the Minibooth. All of us have been to gamedev conferences before but this was the first time exhibiting for any of us. Willy Chyr has written a really good overview of the Minibooth setup which I will not duplicate. In preparation, Colin and Christine hand emailed approximately 200 journalists and youtubers resulting in ten interviews during the show. The Indie MEGABOOTH provided a press list which was invaluable here. We had a number of impromptu interviews as well, possibly as a result of this outreach. We also organized a press dinner with demos for several more people. We designed and printed official game t-shirts for ourselves as well as postcards to give out. Having never done this before we followed the guide at Indie Boothcraft. I also recommend Indie Hangover’s five part guide to getting the most out of a convention and Andy Moore’s guide to PAX on a budget (Also his latest game ROCKETSROCKETSROCKETS is really really good). The table below details our booth costs excluding travel, lodging, and meals (which cost us about $3000). All told team members spent about $5000. The Indie MEGABOOTH provided the kiosk itself, placard, computer/monitor/keyboard/mouse, and 3 exhibitor passes. Colin had an additional 4 day expo pass through speaking at PAX Dev. We also brought a pair of headphones. We gave out approximately 95% of the postcards and about half the fliers. It’s hard to measure how many people actually visited our website as a result of this, but we assume it was some. It was convenient to have something to hand people interested in the game. Reassembly was miraculously nearly bug free throughout the expo. The game is written in C++, is multithreaded, and is still in an alpha state so embarrassing crashes were something I was very worried about. Right off the bat we had a flickering problem with the Adaptive VSync implementation in the game and had to do a new build to turn it off. Luckily I had brought my laptop and this took only five minutes. We did have a couple hard crashes and general gameplay bugs but by and large our bug fixing paid off and everything went smoothly. The machines provided by Indie MEGABOOTH were extremely fast and we had no performance problems whatsoever. We had 5 people working to make our booth a success: Arthur (me, developer), Peter (composer), Colin and Christine (Indie Voyage), and Yoonah (Arthur’s wife). Manning the booth turned out to be extremely exhausting even with this many people and having the ability to take breaks was essential. Talking to hundreds of players was also very dehydrating – we went through two 24 packs of water bottles (and a number of red bulls). Through some combination of sleep deprivation, overexertion, and constant contact with large numbers of people I also ended up contracting the “PAX Plague” and spent the last two days sniffling. All that said it was very exhilaration – PAX is full of amazing things and we were all glad to get a chance to enjoy the rest of the show. Exhibiting at PAX was extremely valuable for us, both personally and for our fledgling business. The legitimacy and publicity that being a part of the MEGABOOTH brought and the contacts we made with press and other developers were instrumental to the success of our Kickstarter and will continue to be greatly valuable. For me (Arthur) personally, having spent more than a year writing a video game in a very solitary way, the chance to show it to hundreds of people in person was extremely rewarding. Being able to talk to other MEGABOOTH developers from around the world on approximately even footing was just amazing and inspiring. I shared a kiosk with Samantha Kalman showing Sentris and Paul Greasly showing A Fistful of Gun and they were both extremely welcoming, friendly, and interesting. Two different fellow r/gamedev screenshot saturday’rs came to the booth to say hi. Part of the Minibooth package included invitations to a number of parties with free food, alcohol, and the chance to informally network with other developers and with representatives from Valve, Sony, etc. It is hard to overstate how much work five minutes of talking to the right person can save. I have been to GDC and related parties a number of times but being part of the show was a completely different experience. 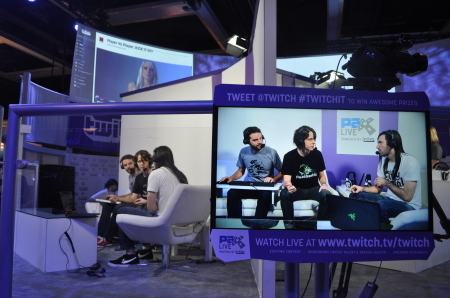 On the show floor, explaining the game succinctly over and over again and watching people’s reactions completely changed how I though about the game myself. Many things I thought of as core features turned out to be irreverent or too complex to explain, and things I thought of as trivialities turned out to be very significant to people. It is very easy to completely loose perspective on a project and showing it to new people is the solution. Every single person at PAX was positive and helpful – people who aren’t interested in your game will simply play one of the thousands of other games. 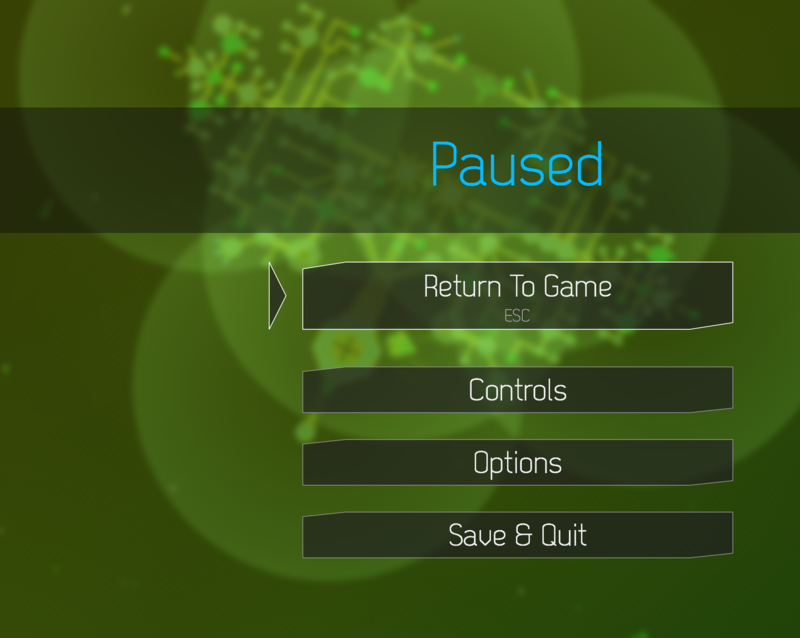 The tutorial we had built into the game turned out to be almost completely useless in the distracting context of the expo floor, and the progression rate at the beginning of the game was too slow for new players to experience the breadth of the game in the short time they had available to play. We ended up loading players into a mid-game save game and walking them through the controls in person. We lost the chance to playtest that first critical part, but have a much better idea of how to fix the tutorial and teach players to play. 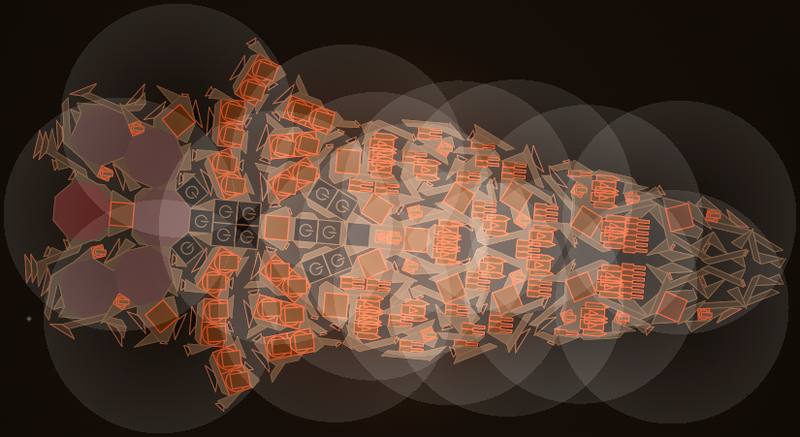 I had read about Alexander Bruce (Antichamber) and other’s experience playtesting their games at conventions and was excited to try this out with Reassembly. 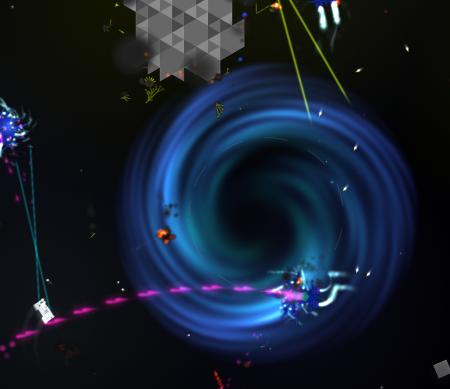 Reassembly is a very sandboxy game though – there aren’t specific parts of the game that are trying to elicit specific emotions from the player. Rather it’s an interesting world that generates open ended circumstances that you can interact with on a variety of levels. I learned a lot about the UI – this is awkward, this is confusing, this is intuitive. Many people shared suggestions about the game, new types of weapons or armor, strategies for procedurally generating spaceships. I got a much better idea of what kinds of people are interested in the game and why (lots of software engineers, for some reason…). Overall it was more of a mind-expanding experience than a focused playtest. We were selected to appear on the official PAX twitch stream for a ten minute interview on the third day of the show. This was quite an experience and I was frankly terrified beforehand. When I started working on Reassembly it did not occur to me that “being on tv” would be part of the process. Luckily our host, Justin Flynn, turned out to be extremely charismatic and Christopher Floyd from the MEGABOOTH team offered some perfectly targeted words of encouragement. Having spent two full days explaining the game to people, we were vastly better prepared than before PAX and it went smoothly. Stay tuned for a Part 2 discussing our Kickstarter.